Limited edition fine art litho print, signed & numbered by the artist. The three surviving J-Class Yachts raced together at Cowes for the first time in 65 years during the 150th Anniversary of the America’s Cup in 2001. For this race Endeavour, Velsheda and Shamrock V were joined by the 23 metre Cambria. 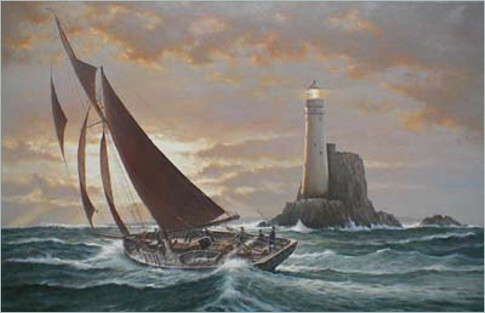 Marine Artist Rodney Charman was on a support vessel for the J-Class Yachts. This enabled him to experience the action close up and in turn produce the stunning original oil painting from which this fine art print has been faithfully reproduced. The start of a race is always tense and crucial. The size, power, beauty and speed of these yachts is something to behold as they stir up the waters of the Solent. While Shamrock V and Cambria power up the shoreline with one minute to go, Velsheda, ahead and to leeward of Endeavour, tacks for the line. The two yachts are 100ft apart as Velsheda squeezes up. Endeavour’s helmsman responds to the bowman’s frantic signal to swing the bow up. It is essential for Endeavour that she stays to windward of Velsheda. All is surreally quiet as the two giants pass within inches of each other. Endeavour pulled away on the opening upwind leg and maintained her lead to win the race. This powerful print is presented with a white border. The names and sail numbers of the yachts are shown below the image with the title and description printed centrally below.